The number of instances discovered at Apple's suppliers were greatly improved in 2011, even as Apple significantly ramped up its number of audits. In all, 229 audits were conducted throughout the supply chain in 2011, an 80 percent increase from 2010. Those audits discovered six active and 13 historical cases of underage labor at five facilities. In each case, Apple said, the facility had insufficient controls to verify the worker's age, or to detect false documentation. In those cases, Apple required that the suppliers support the young workers' return to school. The iPhone maker also worked with suppliers to improve their management systems, like recruitment practices and age verification procedures, to prevent future instances of underage labor. "We have a zero-tolerance policy for underage labor, and we believe our system is the toughest in the electronics industry," Apple said in highlights from the report. "In 2011, we broadened our age verification program and saw dramatic improvements in hiring practices by our suppliers. Cases of underage labor were down significantly, and our audits found no underage workers at our final assembly suppliers." For comparison, last year's annual report found 49 underage workers at 9 facilities overseas. One of the facilities was responsible for most of the child labor instances, with 42 underage workers. Upon discovering those violations in 2010, Apple required the supplier to support the workers' return to school. It also terminated business with the offending facility. 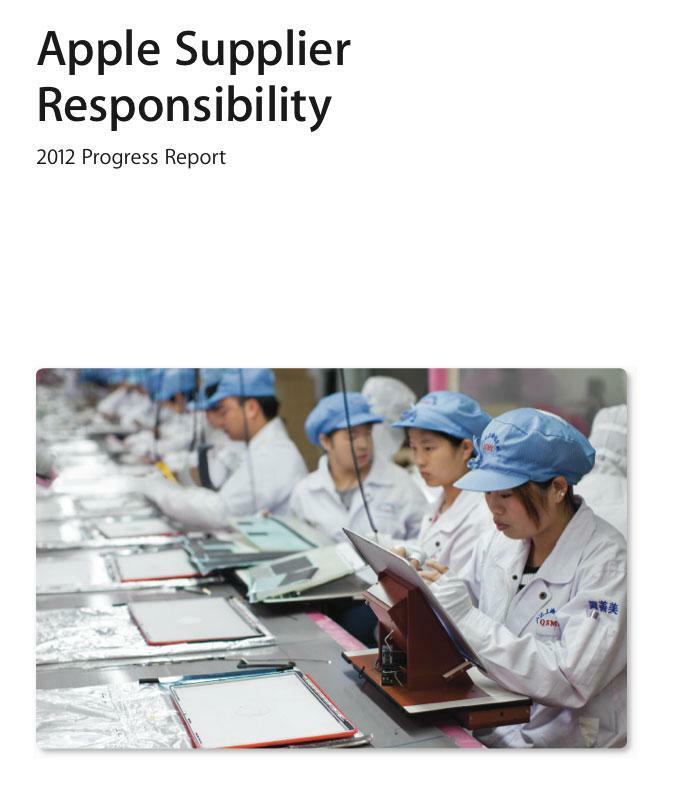 The latest 2012 Supplier Responsibility Progress Report, which is now available for download from Apple, includes the details of more than 100 first-time audits. "We continue to expand our program to reach deeper into our supply base, and this year we added more detailed and specialized audits that focus on safety and the environment," Apple's summary reads. The audits included detailed reviews at 14 facilities conducted by third-party environmental engineering experts. Those environmental were in addition to the standard audits Apple has conducted for years now. Apple also noted that the company continues to offer education opportunities at suppliers' facilities free of charge. More than 60,000 workers have taken advantage of this and enrolled in classes.